The - generated- sandy beach of Barcelona are about four kilometres long. This begins in the district Barceloneta and covers with shorter breaks approximately 60 kilometres to Malgrat de Mar in the north. The actual beach of Barcelona is a total of around four kilometres long and over the entire length well withon reach of the subway. Behind the beach is a promenade with palm, the Paseo de Marítim. Along the beach there are showers, bars and shops. The beach area, which is reserved for swimmers, is marked by buoys. For many years the bathwater on Catalonia's coastline is becoming cleaner. Today you can swim safely along the shore. Also in Spain has been a long time the term "environmental protection" which is no longer a strange concept. Thus the water quality continuously improved and has been consistently good for several years. To ensure safety in the water the beach is guarded by rescue swimmers, the beach is regularly cleaned. There are several wheelchair ramps to get to the beach. How high average water temperatures are cab be found on our climate page. Bathing season is from May to September and depending on how much you like colder water this can be longer. On the beach there are also some attractions: The sculpture by Rebecca Horn Homage to Barceloneta (metro: L4, Barceloneta) from 1992 recalls the kiosks for seafood, which is in favour of the beach design at the Olympic Games being demolished. At the end of the sandy beach near the two towers on the outskirts of Barceloneta, the 50-meter-long copper fish as a symbol of Barcelona established. In hot weather, the three beach sections Barceloner Platges Sant Sebastià, Barcelonata and Passeig Maritím are very full. 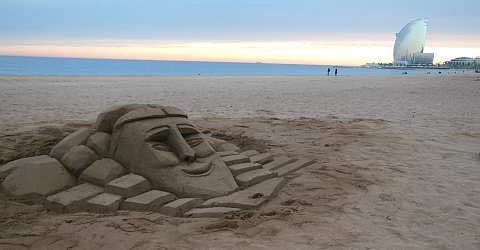 An alternative are the beaches of Sitges or Castelldefels or the beaches further north on the Costa Brava. As mentioned above, a coastal road is located between the beach and town. There are no hotels in Barcelona, which are directly close to the beach. When you are ready to go about 400 -500 meters, you will find in any case an hotel. These hotels are usually of high standard from 4 stars. Overall the approximately 4.5-kilometer long beach of Barcelona is divided in eight sections, all with sandy beaches and wide variety of facilities available. The beach of Barcelona begins roughly at the lower station of the cableway Sant Sebastià. The cableway runs up through the port directly to the Montjuïc. The tower of the cableway right next to the Barceloneta district is very striking. The beach section which is southwest of the tower is the Platja de Sant Sebastià. This beach goes directly to the beach (Platja) Barceloneta. Together, these two beaches with a total length of 1.1 kilometres accumulate the largest beach section of Barcelona. Because of their proximity to downtown and the many restaurants that are located in the Barceloneta district, these two beach sections are the most popular beaches of Barcelonaare, alike of locals and tourists. After the Olympic marina the beach sections are seperated by breakwaters, which are built into the sea. Right on Port Olímpic begins the approximately 400 metres long Platja de la Nova Icària. This beach is the center section of Barcelona's beach. The Nova Icària beach is relatively quiet, which makes it particularly popular for families. The approximately 600 metres long sandy beach was created for the Olympic Games 1992. It is one of the most beautiful beaches on the coast of Barcelona. And it is not as animated as the others, the beaches located closer to downtown. There are no general rules in Catalonia whether nudism on beaches is allowed or not. In Barcelona, it is therefore in principle it is allowed anywhere to undress, if not by that a "public nuisance" exists. In principle, this scheme is for the entire metropolitan area of Barcelona. Because this - very theoretical - rule is very stretchy, you will find some sections of beach, where nudism is operated. Here you will find also dressed guests. In Barcelona the nudist beach is at the Platja de la Mar Bella. This is from the port Olímpic approximately 1,500 metres away in the north-east direction at the Esportiu Parc Parc de la Mar Bella. This is a small sports ground with two football fields and gym. The nudist beach Mar Bella is located between the two breakwaters in front of these sports facility. This 500 metres long section of beach between the breakwaters which is the border of the naturist beach and the Platja Llevant. The 380 metres long Platja de Llevant is created in 2006, and thus the beach is the youngest. This is a bathing area in the Parc del Fòrum, a port, cultural and industrial area which marks the northeastern end of the beach (indicated by the huge photovoltaic plant on a pier into the sea). There are no sandy beaches, but a seawater pool. Think on the beach at sufficient sunscreen, even on cloudy days.